Porte de l’Enfer Cliffs in GuadeloupeA tiny slice of France in the tropics, the Caribbean Island of Guadeloupe is the hub of the Caribbean’s Creole culture. In addition to its exquisite Creole cuisine and its Gaelic flair, Guadeloupe offers some of the most spectacular beaches and mountain terrain. Boasting a vibrant mix of African and French influences, Guadeloupe is as famous for its rum and sugar as it is for its resorts and beaches. The resorts are not as plush and luxurious as those on Jamaica or Anguilla, but you can still have a real paradise island experience at some of the smaller inns where the local food, and the peace and quiet, will be the highlight of your stay here. This lush Caribbean Island offers a unique blend of cosmopolitan cities with rustic hamlets, secluded beaches and rainforests. The economy of Guadeloupe depends entirely on tourism, agriculture, light industry and services. It also largely depends on mainland France for large imports and subsidies. The tourism industry in Guadeloupe has been growing exponentially, with most tourists coming from the U.S. and an increasing number of cruises visiting the island. Crops like eggplant, bananas, and flowers have now gradually replaced the traditional crop of sugarcane. Root crops and vegetables are also cultivated for the locals, even though Guadeloupe is still largely dependent on food imported from France. Light industry includes rum and sugar production. Most fuel and manufactured goods are imported. Unemployment on the island is considerably high, especially among the youth. Because Guadeloupe comes under the same monetary system as that of mainland France, the official currency of the island is the Euro (€). At present, the rate of exchange is €1= US$ 1.30. If staying in your favorite destination for a week or two is just not enough, then the beautiful Caribbean island of Guadeloupe offers some very interesting Caribbean real estate opportunities. From ultra-lavish estates to modest cottage hideaways, this tropical island will present some very intriguing investment options. 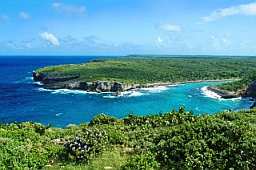 For example, there are oceanfront homes with acres and acres of garden located on the Pointe des Chateaux peninsula, which lies on the eastern side of Guadeloupe. These three bedroom houses have large private swimming pools, a garage and are located in upscale residential neighborhoods. Buying such a house on any of the other Caribbean islands would probably cost you millions of dollars; however, on Guadeloupe these houses start from $540,000! When in Malendure, or its neighbor Bouillante, which is on the Basse-Terre’s West Coast, you will find a few real estate agents in the town of Basse-Terre that speak both french and english. 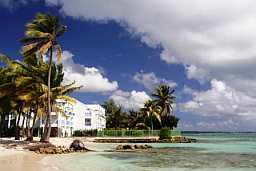 They are well suited to assist you in sourcing real estate investment options in this traditional part of Guadeloupe. There are houses of about 1,100 square feet and that start at $71,000. For such a price, your house will probably be inland in a tiny village like Saint-Claude, but similar houses can be found on the coast for $121,500. The main resort towns of Saint-François, Saint-Anne and Gosier, which are all in the south, have some very interesting real estate options. Saint-François, with its spectacular beaches, faces eastwards and offers some very exciting adventure opportunities. Studios in Saint-François cost about $47,000. However, these studios are small, at 340 square feet, and have a terrace. You will find much larger one-bedroom apartments and condominiums in lavish residences at Marina that start from $84,500 and go up to $137,000. A relatively little known Caribbean island with subtle French influences, the Caribbean island of Guadeloupe seduces all who take the time to get to know her. 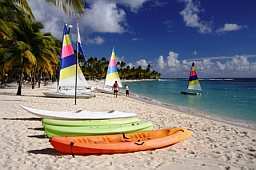 Given its tropical location, it isn’t surprising that the leisure activities in Guadeloupe are mainly centered on the water and the beach. And taking into consideration the number of resorts on the island, it also isn’t surprising that there are loads of opportunities for tennis and golf. 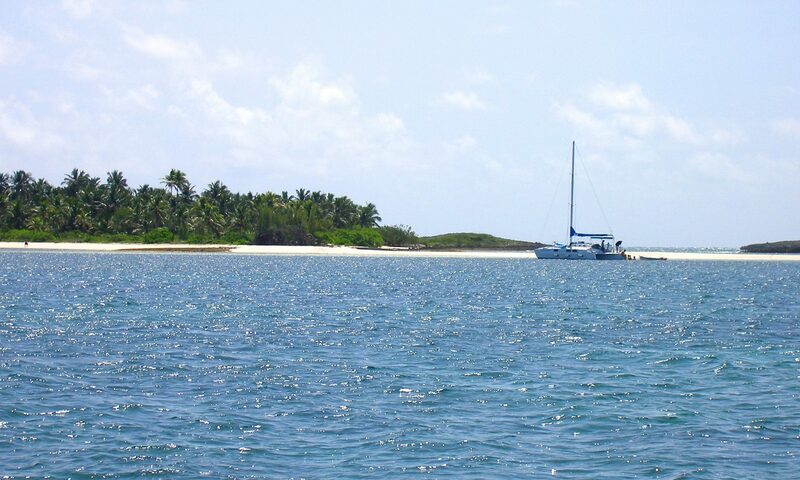 With the diverse marine life that inhabits its waters, and its crystal clear turquoise blue quality, both snorkeling and scuba diving are extremely popular activities in the waters surrounding the island. There are several outfitters that can set you up with first-time courses for amateurs, and dives for pros. In addition to underwater diving, there is also snorkeling which is just as much fun. Watching the tropical fish and other marine creatures that inhabit the surrounding waters is an unforgettable experience. Another popular sport on Guadeloupe is deep-sea fishing. From Yellow Fin to Blue Marlin to Tuna to even Wahoo, the waters surrounding the island are abundant with a variety of fish. There are several outfitters that can get you set up for a full- or half-day excursion in the Caribbean waters. In addition to all these activities, you can also go hiking in the Parc Naturel de Guadeloupe. There are more than 290 km of trails that you can explore through the park. Make sure you carry lots of snacks and water for your hike, and rainwear for potential (and very likely) downpours. Colourful Boats and KayaksGuadeloupe has a plethora of nightspots, which include nightclubs, discos and several varieties of jazz and piano bars. Most hotels offer dinner, dancing and live performances by some of the local groups. The most popular dance music on the island is Zouk, which originated in Guadeloupe and is performed frequently by most of the local bands. Nightlife is a lot more happening in the major resort towns of Bas-du-Fort, St. François, Gosier, Le Moule, and Gourbeyre, which are on the Basse-Terre side of Guadeloupe. Hence, nightspots can be found anywhere and everywhere on the island! There are two major casinos on the island, one in St. François and the other in Gosier. Dress is casual, and wearing jackets and ties are not necessary. The casinos offer American Roulette and Blackjack. Slot machines are kept outside the game room entrances. 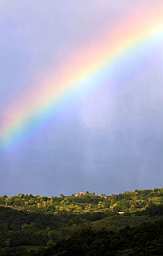 RainbowLike all its Caribbean counterparts, Guadeloupe experiences fairly even rainfall all year, with a wetter climate that starts in July and goes on until November. The wet climate coincides with the hurricane season. Higher up in the mountain regions, the rainfall becomes relatively heavier. Guadeloupe experiences tropical heat with temperatures that average at 89°F during the day, and drop to a warm low of 70°F in the night. Temperatures are much cooler at the higher altitudes. Due to its height, Basse-Terre is a lot cooler and wetter than Grande-Terre. The highest point of La Soufrière receives an average rainfall of 390 inches every year. 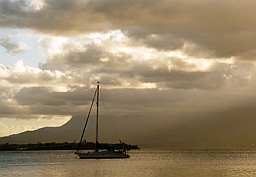 The tradewinds, or the alizés, often moderate the climate. Guadeloupe is situated in the Caribbean Sea at 16°15′N and 61°35′W and has a total area of 1,780 square kilometers. Guadeloupe is composed of five islands, namely Basse-Terre, Grande-Terre, Les Saintes, Marie-Galante, and La Désirade. Basse-Terre is rough and volcanic, while Grande-Terre consists of flat plains and rolling hills. As you go to the north, the French region of Saint Martin and Saint-Barthélemy both come under Guadeloupe jurisdiction. With several international and local air operators flying daily between Paris and Point-à-Pitre, France has one of the best flight connections with Guadeloupe. American and Canadian travelers can fly on Air Canada or Air France, while those tourists who use other operators must connect in Puerto Rico. Crusing YachtThere are many ways to enter or exit Guadeloupe by boat. L’Express des îles runs daily catamarans between Guadeloupe, Dominica, St. Lucia, and Martinique. If you want to rent a car for sightseeing, there are several car rental kiosks at the airport. Driving is on the right side. The taxi and bus systems in Guadeloupe are efficient; however, you might want to learn a little bit of French to get around this beautiful island.